Nanode is a low cost Arduino-like sensor node board intended for web connectivity applications. It allows you to develop web based sensor and control systems – giving you web access to six analogue sensor lines and six digital I/O lines. The schematic and other details can be found on the project’s Thingiverse page. The code can be found here. This is an open source project conceived, designed, manufactured and coded by London Hackspace members. 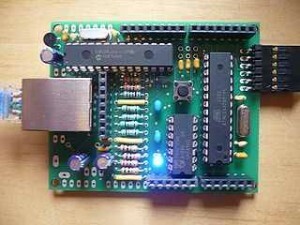 This entry was posted on Sunday, May 1st, 2011 at 3:00 pm	and is filed under Arduino, demonstrations, sensors. You can follow any responses to this entry through the RSS 2.0 feed. You can skip to the end and leave a response. Pinging is currently not allowed. I like how you combine the microcontrollers (that are sort of rivals).This makes it cheaper than to use a wiznet chip and makes it very cool!